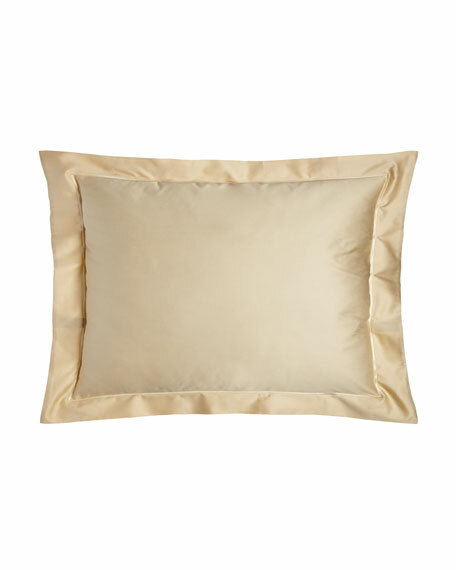 Cotton sateen sham with satin-stitched embroidery. EXCLUSIVELY AT NEIMAN MARCUS Pieced sham with silk sides and brush fringe. Front, silk/polyester/rayon/flax. Back, polyester. Hidden zip closure. 19"
EXCLUSIVELY AT NEIMAN MARCUS Pieced sham with silk sides and brush fringe. Front, silk/polyester/rayon/flax. Back, polyester. Hidden zip closure. 19" x 35". Dry clean. Made in the USA. EXCLUSIVELY AT NEIMAN MARCUS Ikat medallion sham with boxed silk sides. Twisted cording finish. Hidden zip closure. Front, polyester/polyester chenille/viscose/silk. EXCLUSIVELY AT NEIMAN MARCUS Ikat medallion sham with boxed silk sides. Twisted cording finish. Hidden zip closure. Front, polyester/polyester chenille/viscose/silk. Back, polyester. 19" x 35". Dry clean. Made in the USA of imported materials. EXCLUSIVELY AT NEIMAN MARCUS Check sham in cotton. Dry clean. 20" x 36". Made in the USA.